Attendees discuss PVM graduate students' research during the poster session at the 2016 CAWS Symposium. Plans are underway for the 3rd annual Center for Animal Welfare Science (CAWS) Symposium taking place May 18 in Purdue University's Stewart Center. Hosted by the Purdue University Center for Animal Welfare Science, the 2017 symposium titled, "Advancing Animal Welfare Science: Overcoming Obstacles to Implementation," will include lectures, discussions, networking and a poster session with opportunities for researchers, students, veterinarians, industry professionals, legislators and interested members of the community to join together with experts from all over the world. Registration is $20 for CAWS members and students and $45 for other participants. Early registration is still available online! A late fee of $10 will be applied to all registrations after May 9 with registration closing May 11. Earn up to 4.75 continuing education (CE) credits with attendance at the symposium. Click here to register for the CAWS Symposium. Click here to preview the program. As a precursor to the symposium, two special half-day workshops will be offered May 17 with the first workshop focusing on "Integrating Animal Welfare into the Animal Science and Veterinary Curriculum," discussing how to best teach animal welfare science to animal science and veterinary medicine students and taking a look at the learning objectives in animal welfare courses and questioning the animal welfare skillset necessary for graduates to possess. The second workshop will dive into the rise of the humane food movement and the impacts of humane food production on animals, consumers, producers and food safety. The workshops are free and open to the public, but registration is required. Attendees can earn up to 5.25 CE credits at this event. Click here to register by May 11 for the workshops. Click here to preview the program. Dr. Alan Beck, Dorothy N. McAllister Professor of Animal Ecology in the PVM Department of Comparative Pathobiology, and Patti Strand, cofounder of the National Animal Interest Alliance (NAIA), participate in a panel discussion on "Dog Importation and Overpopulation — Are There Really Problems and What are the Welfare Implications?" at the inaugural Canine Welfare Science Forum in May 2016. The 2nd annual Canine Welfare Science Forum will also be returning May 19 in the Purdue University Stewart Center. 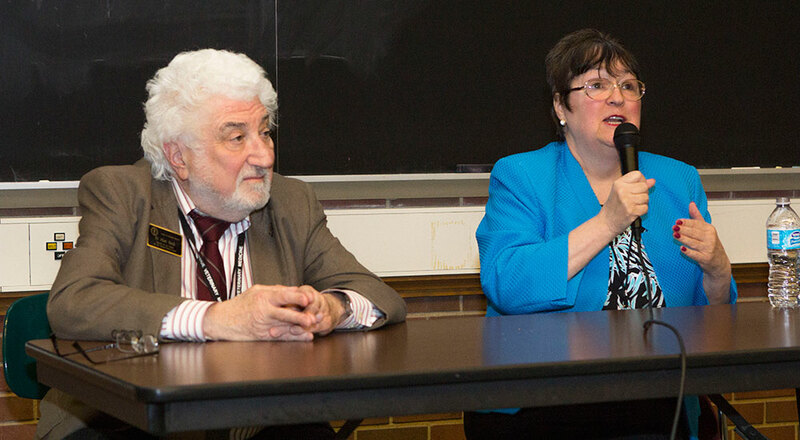 Hosted by the Purdue University Center for Animal Welfare Science, the event drew a capacity crowd at its inaugural session in 2016 with over 200 registered attendees from 23 states. Organized to address the care, welfare and society issues associated with dog breeding, the forum focuses on the practical applications of scientific concepts and research results to improve canine welfare in a variety of settings. The one-day program will include topics such as, "Dietary Management: Implications of Canine Health," presented by Dr. Kate Shoveller, from the University of Guelph; "Long-term Effects of Early Environments on the Behavior and Welfare of Dogs," with Dr. James Serpell, of the University of Pennsylvania; and a panel discussion on the advancements and outstanding challenges in breeding dog health and welfare. Attendees can earn 4.25 continuing education (CE) credits with this event. Register online today! The cost to attend is $39 and $15 for students. Registration closes May 15 for the Canine Welfare Science Forum! Click here to register. Click here to preview the forum's program. The Purdue University Center for Animal Welfare Science is jointly funded by the Purdue University College of Veterinary Medicine and the College of Agriculture. Click here to learn more about the center. Both events are coordinated through the Purdue Veterinary Medicine Office of Lifelong Learning. For any additional questions, email PVMLifelongLearning@purdue.edu.